Author ASA DUNNINGTON has lived his own storied life. Born June 7, 1939, in Logan, Iowa, his adventures have taken him from writing for a newspaper to serving in the Air Force to working on a Presidential campaign. A dreamer in his own right, Dunnington believes in achieving great things, whatever your calling may be. Dunnington met the larger-than-life figure at the center of his book while on vacation with his first wife, who was Emmett Long’s niece. He immediately knew he had found someone special, and he soon agreed to record Emmett’s life story. The resulting narrative history became Selectively Lawless: The True Story of Emmett Long, an American Original. In addition, he has also written an autobiography, What a Life! : An Autobiography. Dunnington is now married to his second wife, Cheryl, and he has three children and nine grandchildren. Emmett Long was born in 1904 in southern Oklahoma and, as he entered his teens, it soon became apparent that he was not going to be content to work for others. His father was a hard-working rancher and his family had helped to build many of the fences that bordered the land, but Emmett dreamt of greater things. Exhibiting a gift for poker playing he picked his last row of cotton and set off for his cousin Decimer’s place. This was the beginning of the story of Emmett’s rise to fame and fortune as a professional gambler. Two years later he returned home, fulfilling his prophecy that he would return in a shiny car with his pockets full of cash. 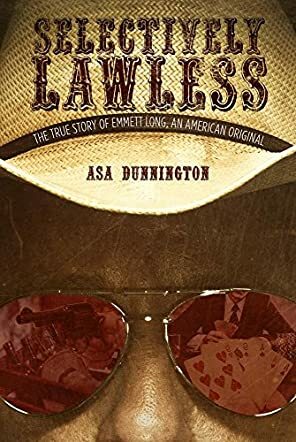 Selectively Lawless: The True Story of Emmett Long, An American Original is the account of Emmett’s life and the legacy he left behind. Asa Dunnington tells a story filled with facts from Long and his family, of one of the true originals born of the times in which he lived. This is a great story of a man who loved gambling and was also aware of the benefits of hard work. Strong as an ox, he could kill a man with one punch and reduce a man to fainting without laying a finger on him. He ran successful speakeasies and provided liquor during Prohibition. He also robbed banks and casinos, yet he was a man who commanded respect and love from those who worked for him. Selectively Lawless is a beautifully told story of a legend of the lawless West and Asa Dunnington is a natural storyteller who tells the tale with humor and pathos. Littered with references to other infamous names from the past, this story spans the growth of 20th century America as well as Emmett Long. Strap yourself in for one hell of a ride and be prepared to laugh and cry with this legend of his times. What a great book! I am half way through it and LOVING it!!!! I am pretty sure this book will fly off the shelves. Highly recommended!